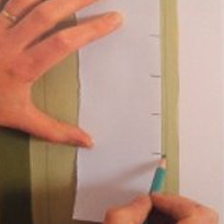 I am presently developing a series of two-day mural & trompe L'oeil workshops based at my small studio in Essex. 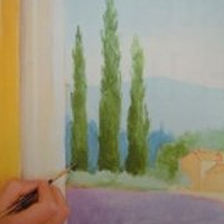 The first course I can offer is for the painting of a trompe l'oeil orange tree in a niche which is also featured in my YouTube video here. This will be painted on a 2ft by 4ft deep sided canvas. A step-by-step work book is also provided with extensive notes, diagrams and templates top use in recreating the design. I will also be painting my own canvas alongside you all so as to demonstrate the various techniques. Class sizes are limited to three with a minimum of two. This means I am easily able to give individual attention and keep the classes informal. All materials required are provided - all you need to bring along is yourself, clothes you don't mind getting paint on and lots of enthusiasm. A simple lunch will also be provided as well as copious amounts of tea, coffee and other refreshments. Classes will run from 9.30 to 4.30. My studio is based in Wickford, Essex - about 15 minutes from the M25 and about 40 minutes by rail from London Liverpool Street. View a map here. 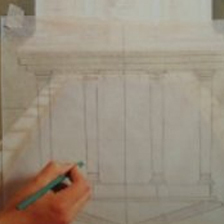 The cost of the two day trompe l'oeil workshop is just £320 - which includes all materials, lunch & refreshments and the painted canvas for you to take home. Please complete the form below if you are interested in further details and, if you have not already done so, please follow me on facebook and twitter for the most up-to-date information on my work and classes. 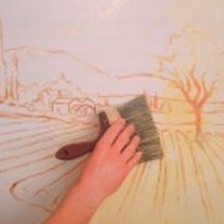 Please e-mail me at classes@chriswestallmurals.co.uk to book a place in a class or telephone me for further details.